Cornelius: I thought I would have an underground cave with a huge T Rex. Mark: I thought I would have a tower made of gold! Eva: I thought I would have some respect! Man entering room: Look alive, there are some campaign backers here. Eva: I'm gonna smile as big as I can, they pay our bills! Eva: Come with us and enjoy a party! Backer 1: A free party? Will there be food? 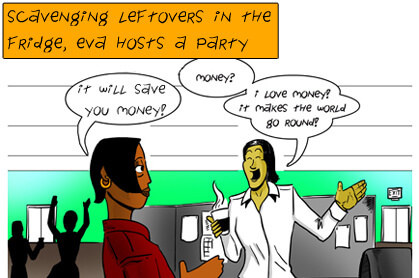 Scavenging leftovers in the fridge, Eva hosts a party. 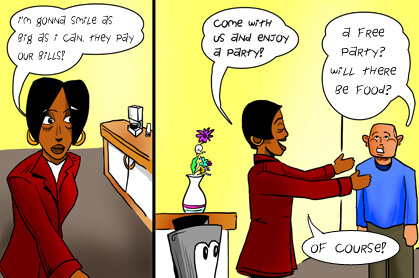 Eva: It will save you money! Backer 2: Money? I love money! It makes the world go round! 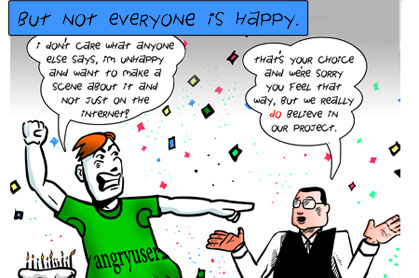 Backer 3: I don't care what anyone else says, I'm unhappy and want to make a scene about it and not just on the Internet. Cornelius: That's your choice and we're sorry that you feel that way, but we really do believe in our project. Cornelius: Still, if you feel you must leave, you are free to at any time. 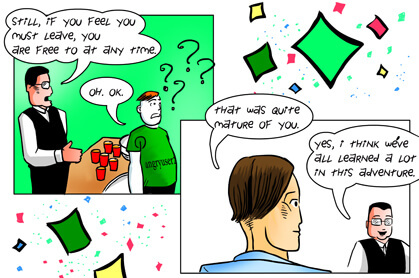 Mark: That was mature of you. Cornelius: Yes, I think we've all learned a lot in this adventure. Cornelius: But we can't be all work and no play, isn't that right, Eva? Eva: Radbot is our hero. Cornelius: And now he has a cape! 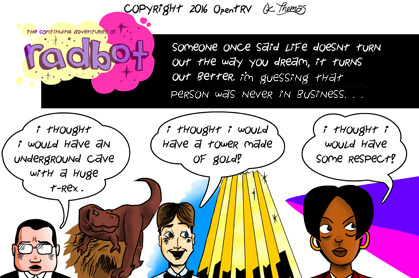 Radbot Origin Myth 8 "Riches?" (Copyright © OpenTRV 2016) Oz Thomas, editor Damon Hart-Davis. So is this how it all ends? Without towering heaps of gold or even a big party? And with bad trolling? Our heroes will have to fight another day to grow the business and move the needle on climate change! 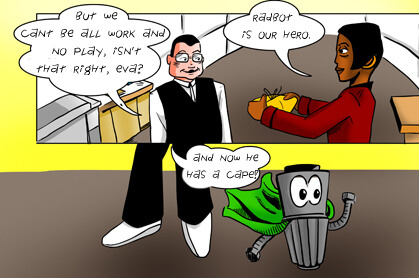 But Radbot does have a cape now, so all is well. Unlike the cartoon (which the el Reg commentards didn't get to see, only a mea culpa), we pulled the launch: Here's the thing: We've pressed pause on my startup. So, it turns out that this is the real world, and even when the CEO wishes for a pony [or a unicorn, or a Cockney £25, it doesn't always trot up. 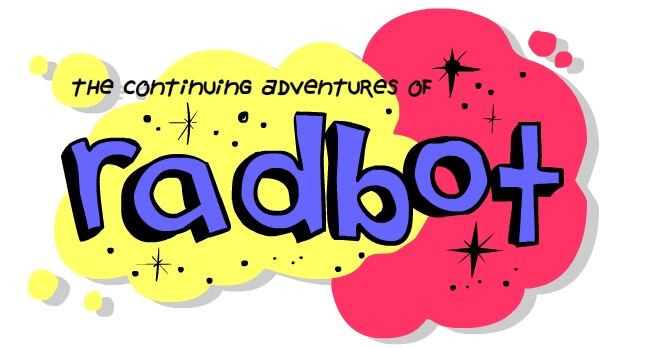 Radbot is still very much alive and kicking you'll be pleased to know. As I write this thus update we're working on a smaller, quieter "TRVx", with a new CPU and improved UI, alongside a (non-crowd-) funding round to keep us in good shape for several years to come. In any case we may yet have some sort of Kickstarter or Crowdcube events, as much for marketing stunts as for cash, or maybe for a special side project. All reasonable routes to engage with customers and keep solvent are worth keeping open! 2016/11/25: The Register: Here's the thing: We've pressed pause on my startup: It hasn't ceased to be... but crowdfunding? Not happening. First published 2017-06-01 , updated 2019-04-18 , rebuilt 2019-04-19 . Site copyright © 2007-2019 Damon Hart-Davis. Hosted by ExNet.